Goodmans has entered the affordable Wi-Fi enabled "all-in-one portable product” market with the GWF101IP, pictured. 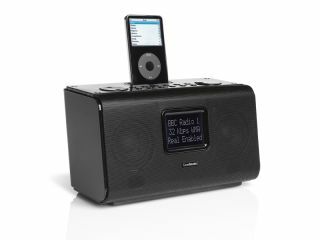 While the company could have made more of an effort in naming this does-it-all internet radio, it plans to release it this coming April for a competitive £99. You can search for stations via country, continent, genre or locality. And should you tire of the 6000+ stations on offer, you can also bang your iPod into the (almost mandatory) in-built dock. “Have fun surfing global radio stations from Timbuktu to Trinidad & Tobago, including the usual UK FM and DAB radio stations for those less adventurous travellers,” Goodman’s tells us. It adds: “The GWF101IP also incorporates a Clock Radio Alarm so you can wake up to a choice of Buzzer, iPod or PC stored music. Not a bad price, if you are looking for a decent birthday or Easter pressie this month. Still, we’d rather have a Chumby.